Your dog will stand out when walking them around the neighborhood in this adorable, glittery lime green dog leash! This leash features sparkling glitter with a laminated seal so the glitter stays intact. 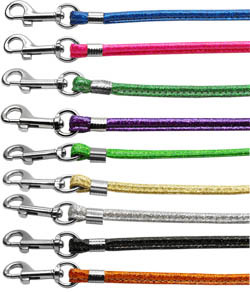 It’s also equipped with a sturdy metal clasp to ensure that it safely secures around your dog’s collar. This leash measures 4ft. in length. Looking for this dog leash in a different color? It’s also available in the following alternate colors: silver, blue, gold, purple, orange, emerald green, black, and pink.